Self-repair: indicating ability to heal itself without outside intervention. Self-replication: More accurately labeled "exponential replication," self-replication refers to the process of growth or replication involving doubling within a given period. [ZY] Examp[le: create one assembler. Program it to create another, and program that one likewise, etcetera, until you have a speficied amount [which is the important part -- how to make them STOP]. Singularity: Defined by Vernor Vinge as the "postulated point or short period in our future when our self-guided evolutionary development accelerates enormously (powered by nanotechnology, neuroscience, AI, and perhaps uploading) so that nothing beyond that time can reliably be conceived. ...a future time when societal, scientific and economic change is so fast we cannot even imagine what will happen from our present perspective, and when humanity will become posthumanity." Another definition is the singular time when technological development will be at its fastest. A grand evolutionary leap. Spintronics: AKA: Quantum Spintronics, Magnetoelectronics, Spin Electronics. Electronic devices that exploit the spin of electrons as well as their charge. Unlike conventional electronics which is based on number of charges and their energy, and whose performance limited in speed and dissipation, spintronics is based on the direction of electron spin, and spin coupling, and is capable of much higher speed at much lower power. See our page on Spintronics. Also see Electronics and the single atom for a collection of articles (12 June 2002). Star Trek scenario: Someone builds potentially dangerous self-replicating devices that spread disastrously. [FS] Again, "BAD" goo. Superlattice Nanowire interwoven bundles of nanowires using substances with different compositions and properties. Technofobics: Those who have a phobia to technology, and/or to advances in technology. Top Down Molding: [AKA: mechanical nanotechnology] Carving and fabricating small materials and components by using larger objects such as our hands, tools and lasers, respectively. [NTN] Opposite of Bottom Up. Transistor: the basic element in an integrated circuit. An on/off switch (consisting of three layers of a semiconductor material) that consists of a source (where electrons come from), a drain (where they go) and a gate that controls the flow of electrons through a channel that connects the source and the drain. There are two kinds of transistor, the bipolar transistor (also called the junction transistor), and the field effect transistor (FET). Ubiquitous Computing: Also known as "embodied virtuality", "smart environment" and "ambient intelligence". Computers that are an integral, invisible part of people's lives. In some ways the opposite of virtual reality, in which the user is absorbed into the computational world. With ubiquitous computing, computers take into account the human world rather than requiring humans to enter into the computer's methods of working. [AS] See our Smartdust page. Utility Fog: [AKA: Polymorphic Smart Materials] Objects formed of "intelligent" polymorphic (able to change shape) substances, typically having an octet truss structure. Concept concieved by Dr. J. Storrs Hall. "Imagine a microscopic robot. 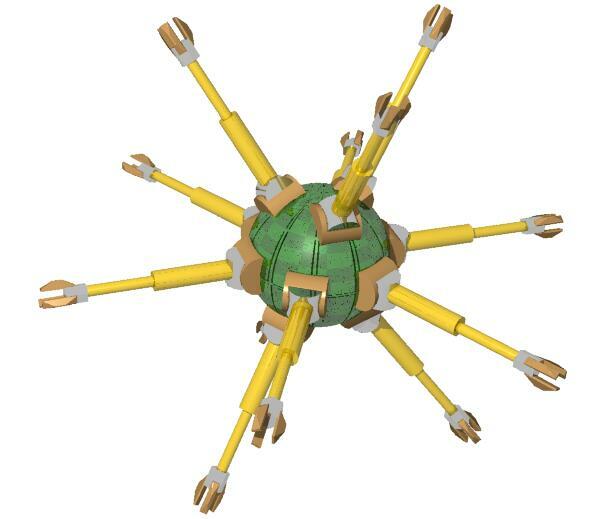 It has a body about the size of a human cell and 12 arms sticking out in all directions. 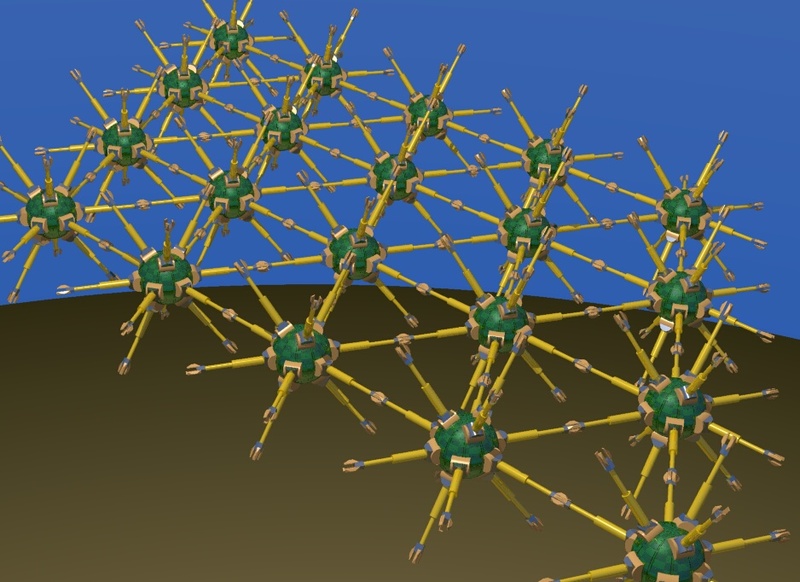 A bucketfull of such robots might form a 'robot crystal' by linking their arms up into a lattice structure. Now take a room, with people, furniture, and other objects in it -- it's still mostly empty air. Fill the air completely full of robots. The robots are called Foglets and the substance they form is Utility Fog, which may have many useful medical applications. And when a number of utility foglets hold hands with their neighbors, they form a reconfigurable array of 'smart matter.'" Copyright Dr. J. Storrs Hall Research Fellow of the Institute for Molecular Manufacturing. See Nanotech Utility Fog, and On Certain Aspects of Utility Fog, & Utility Fog: The Stuff that Dreams Are Made Of, by J. Storrs Hall, and Polymorphic Smart Materials.